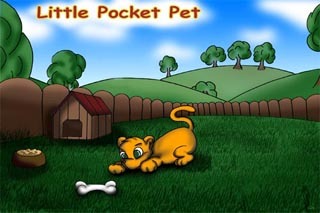 Little Pocket Pet is a virtual pet for your Palm OS device. This pet has features similar to those of a Tamagotchi and a desktop pet. Come visit them and find one that you like. Feed your pet, keep him clean, and teach him many tricks. Your pet will learn from you what he should--and should not--do! Watch your pet grow older, and watch his behavior change. Give him medicine when he needs it or he might die! When he dies, if you are lucky, he might return from the grave. Runs in true real time: new surprises every time you turn the game on. Generates thousands of unique pets with their own look and personality!